What was the last class 1 railroad to retire alco locomotives? I know that no current class 1 owns an alco, and they are now on shortlines, tourist roads, museums, and sadly, the scrapper's torch. But what was the last class 1 to retire them? Last US Class 1 I suppose must've been the Delaware & Hudson until their 1989 demotion from Class 1 status. 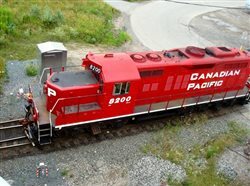 Including Canada and expanding it to encompass MLW and Bombardier designs that used Alco engines, Via Rail's retirement of their last LRC locomotives in 2001 would be the end of Alco prime movers in US/Canadian Class 1 power. And if we stick to designs that were closely related to Alco power, both CPR and CNR ran things like big Centuries and RS-18's (The Canadian version of the RS-11) until the end of the Alco/MLW era in the mid to late 1990's on those systems. Mexico, I don't have a clue but would guess late 1990's with privatization bringing an end to the last survivors. I think the CNW also kept a few ALCos running into the late 80s. The last CN MLWs (mostly the later M420 models) were retired in 1998. The CP RS-18s and Centuries were retired in the early to mid 1990s. The Mexican units were pretty much killed off by the start of privatization, although a few may have stuck around into early 2000s. C&NW's smaller 251 powered Alco's went in 1986. The ore service C-628's largely were retired in October 1990, but had last operated in late 1986. But I suppose they count, since the topic creator didn't ask when the last Class 1 operations happened, but rather asked when the last retirements happened. D&H though operated Alco's as a US Class 1 well after C&NW last did, continuing past its demotion from Class 1 status and lasting into the early CPR days (And with MLW cousins from Canadian Pacific making regular appearances well after I believe the final D&H Alco's had been strickened). 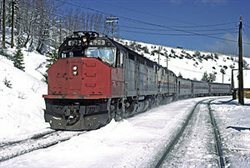 The Alco/MLW era on Canadian National ended in February or March of 1998, excluding perhaps some of the Cat repowered RS-18's maybe being rostered officially for a brief time after the Canadian National takeover of BCRail. On Canadian Pacific, the era of Alco/MLW locomotives ended on July 8th 1998 when the last three were retired. Several retired CPR C-424's and RS-18's though had been converted to cab cars and looked the part for a while longer. The Cat repowered M636 #4711 was withdrawn on May 27th 1998, with 10 full fledged MLW locomotives still in service afterwards. The Museum never owned them, the owner was simply leasing some track and site space. I'm with Leo_Ames, thanks to UP the ALCO era still goes on.